Anime by and large has been lacking ambition lately. Possibly it’s just that I’ve been watching less of it, but there are relatively few titles that people bring up as challenging or sophisticated these days, in a world of fanservice and idol anime. But there’s still noitaminA, the programming slot that usually at least attempts to do something a cut above the average. 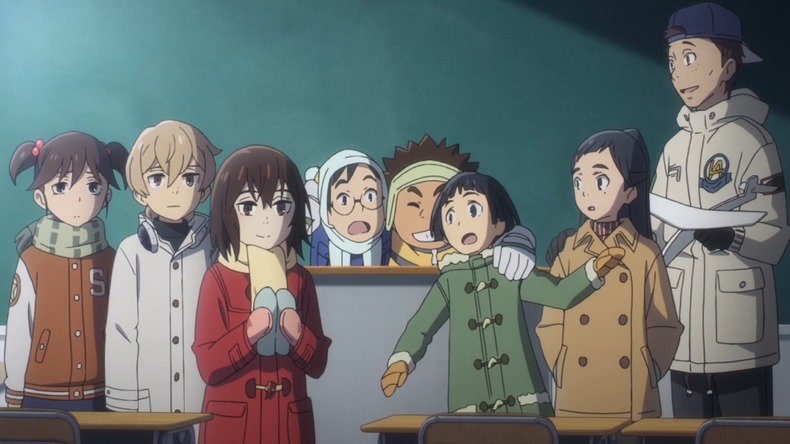 And so it was with Boku Dake ga Inai Machi, which takes a more serious seinen tone with its murder-mystery storyline and brings together themes and modes of a variety of recent hits. Directed by Itou Tomohiko, buoyed up by his successes with Sword Art Online but having rather more in common with his breakthrough work with Hosoda Mamoru – in particular TheGirl Who Leapt Through Time, this series was also well-marketed. My own interest was piqued by a large and attractive poster for the show in Shinjuku station. It looked like a cute coming-of-age story and over this Christmas break, I binge-watched the 12 episodes very quickly. To be honest, it’s not what I hoped it would be. It aims for the cleverness and paranoia of Monster with the mind games of Death Note and the cute, smart kids in peril of Tokyo Magnitude 8.0 and some of the glib, vaguely Murakami-esque detached observations of Bakemonogatari. While there are some superbly-done parts of Boku Dake ga Inai Machi, ultimately I don’t think it hangs together nearly well enough, nor are all the extraneous parts necessary. In a convoluted time-travelling plot, our hero Fujinuma Satoru has a magical power. When something terrible is going to happen, he inadvertently goes back in time a few minutes so that he can put it right, saving lives and avoiding disasters. This is presented in a very direct echo of The Girl Who Leapt Through Time using film effects. When a far more dramatic crime erupts, he is sent back much further, to his elementary school – where the events that led to the recent crime were set in motion. This is an interesting, if not particularly original, set-up – Satoru is a 29-year-old in a 10-year-old’s body and must investigate a set of child abductions to save himself and his loved ones in the future. However, this whole section didn’t ring true at all. Satoru doesn’t have much personality beyond an endearing tendency to speak his thoughts out loud and then get embarrassed, and there’s no exploration whatsoever of the strangeness and hilarity that must come from a 29-year-old, with the mind of a 29-year-old, going back into his 10/11-year-old body. Indeed, the kids around him, with only a couple of exceptions, all speak in the weirdest artificial diction, almost all of them preternaturally smart and basically miniature adults. The pacing of the series is all off-kilter because the set-up is saving the first child who will be abducted. This not only rings false when the danger to one of Satoru’s closest friends who will be the second victim is barely even raised, but creates an awkward set of overlapping arcs where even if the problem is solved we then lose the sense of triumph and get an uncomfortable jolt of then moving to the next stage of the plan because the murderer hasn’t been dealt with. The romantic undertones are half-baked because the script calls for a cute budding love story but also occasional reminders that this is a 29-year-old mind starting a romance with a 10-year-old girl. And ultimately there’s only so much satisfaction that can be derived from a crime detective story where ‘How can you predict what’s going to happen?’ can only be answered with ‘Because of my magical time-travelling powers.’ The idea of eyes flashing red with fury or malevolence doesn’t work either, and there’s no attempt at sophistication when giving the bad guy motives. There are things I certainly much admired here. The show does an amazing job of examining mother-child relationships, with some of the warmest moments are simple family affairs. There’s at least an original, if unlikely, ending arc to finish things off and further complicate the timeline. I enjoyed the dynamics of Satoru’s gang of schoolmates and wanted to see them developed more. And I did enjoy how the series was drawn and animated, which was very reminiscent of A1’s big-screen debut, Welcome to the Space Show. But I have to say, I hoped for much more, and feel that the same things have been done much better elsewhere.